I have designed a potholder that matches my Unicorn Mandala. 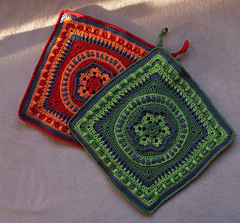 The potholder uses part 1 of Unicorn Mandala CAL and the I’ve added some rounds to do a potholder or a square table-cloth perhaps. -Written pattern in English - US, Swedish and German. -Stitches used in this pattern are described on my blog.